Search "bottle" 6 results have been found. Our newest creation. 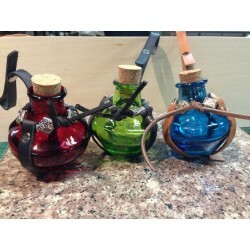 Perfect for holding potions or enchanted beings. Approx 3.7 oz. with cork stopper.Snap loop to affix over any belt. Beads are random but will generally be silver for the black strap and gold tone for the brown strap. 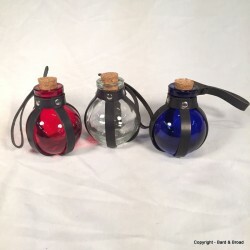 For the busy wizard or mage on the go. 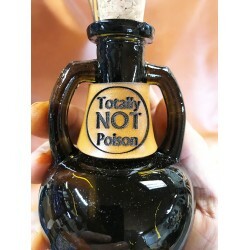 Glass potion bottle holds 8 oz. Leather wrapped with belt loop and snap closure. Glass is 40% recycled. 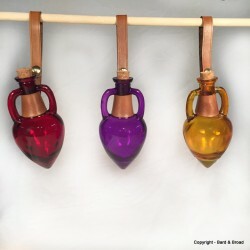 Color is lead free and baked onto bottle. Gently hand wash. The amphora has been around for thousands of years. This classic design was the perfect shape for carrying everything from wine to olive oil.Ours is perfectly suited for carrying 6 oz of your liquid of choice. 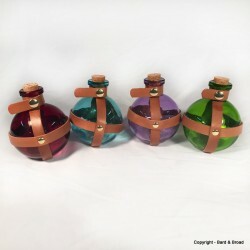 Buttle is 40% recycled glass.Color is lead free and baked onto the bottle so refrain from scrubbing with harsh cleaners.